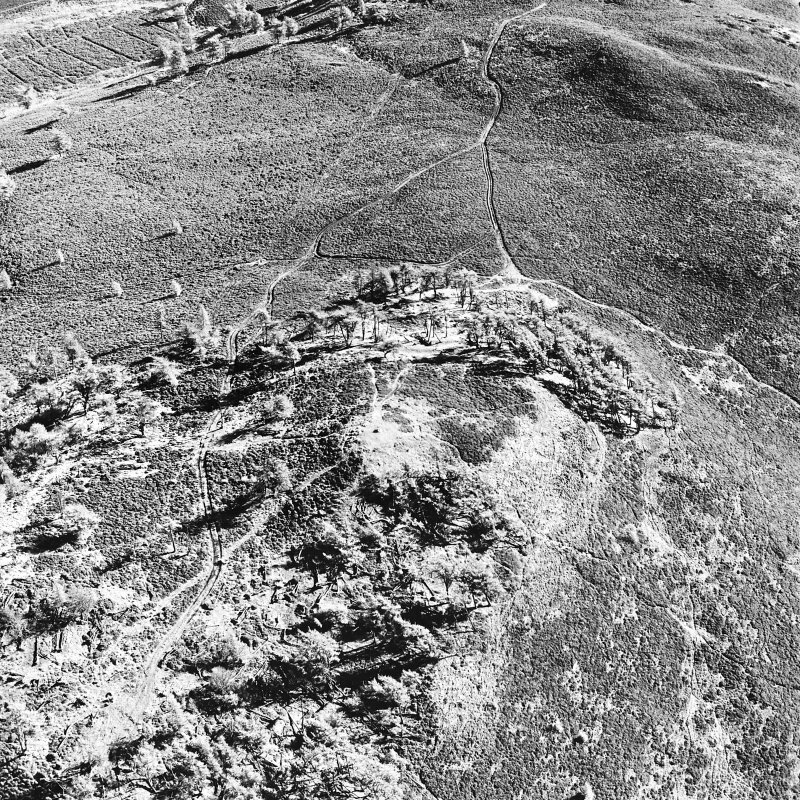 Oblique aerial view centred on the remains of the fort and possible cairn, taken from the wNW. 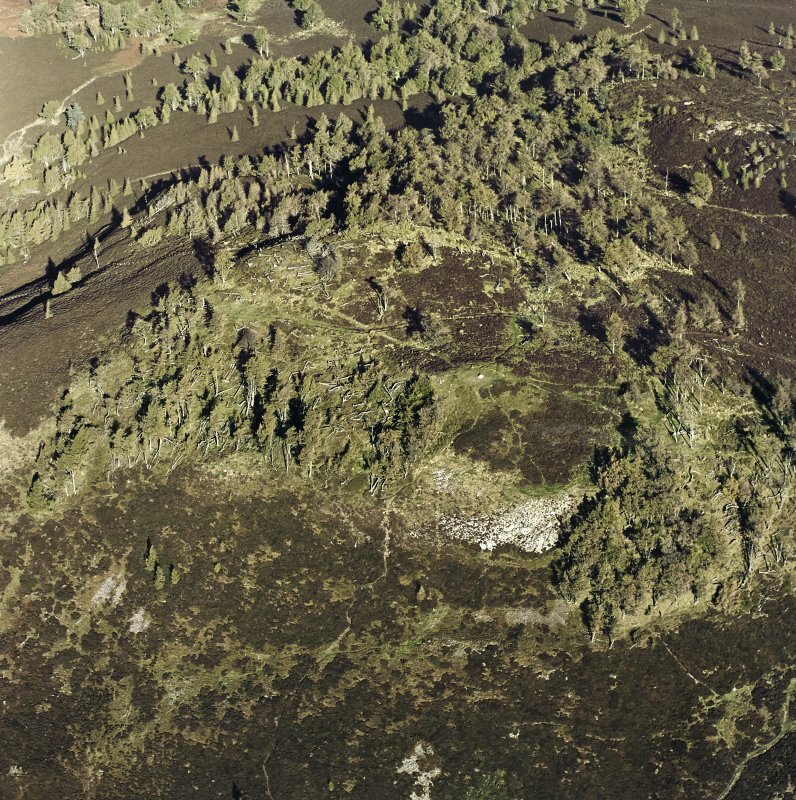 Oblique aerial view centred on the remains of the fort and possible cairn, taken from the NW. 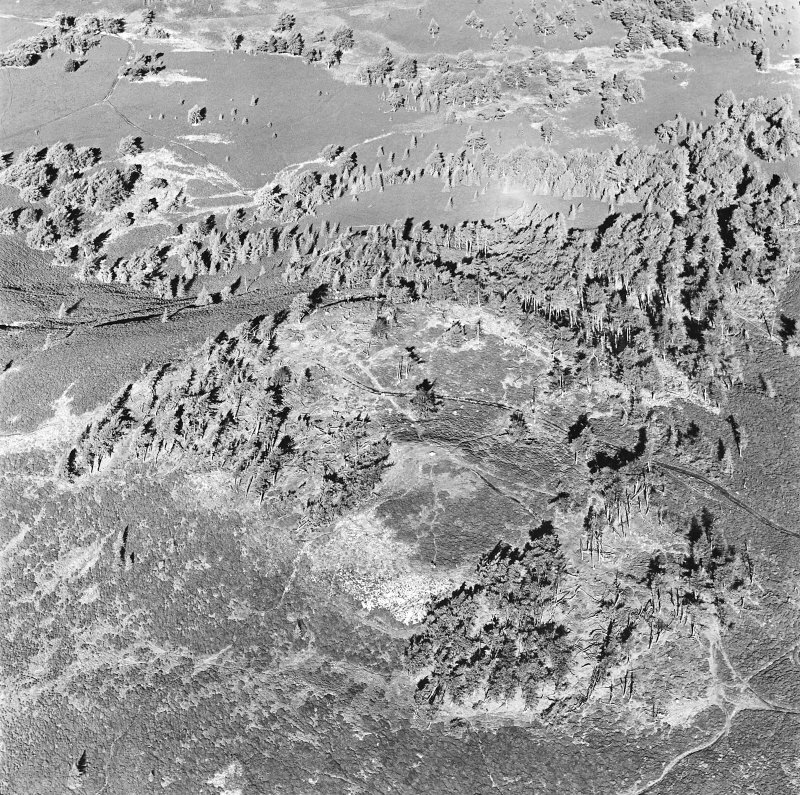 Oblique aerial view centred on the remains of the fort and possible cairn, taken from the S.
Oblique aerial view centred on the remains of the fort and possible cairn, taken from the SW.
Oblique aerial view centred on the remains of the fort and possible cairn, taken from the WSW. 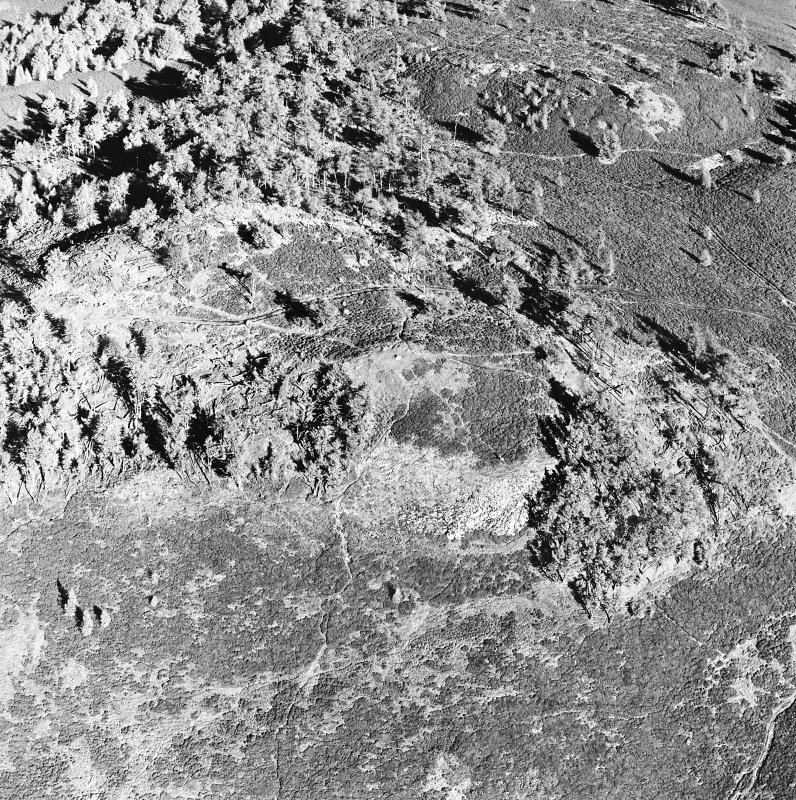 Oblique aerial view centred on the remains of the fort and possible cairn, taken from the W.
Oblique aerial view centred on the remains of the fort and possible cairn, taken from the NE. 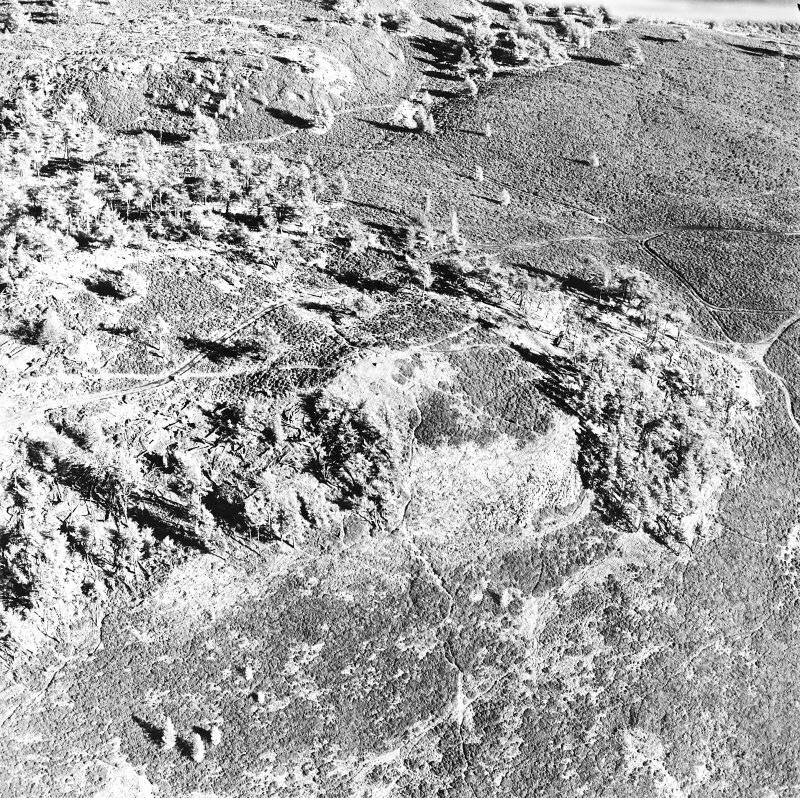 Oblique aerial view centred on the remains of the fort and possible cairn, taken from the SE. 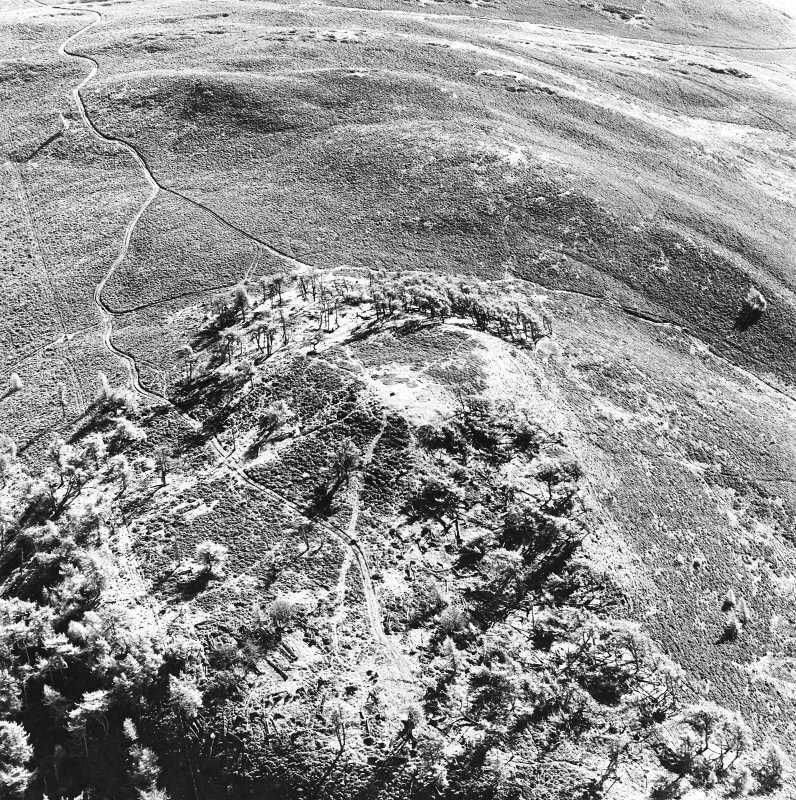 A fort occupying a plateau slightly below the crest of Auchterhouse Hill. 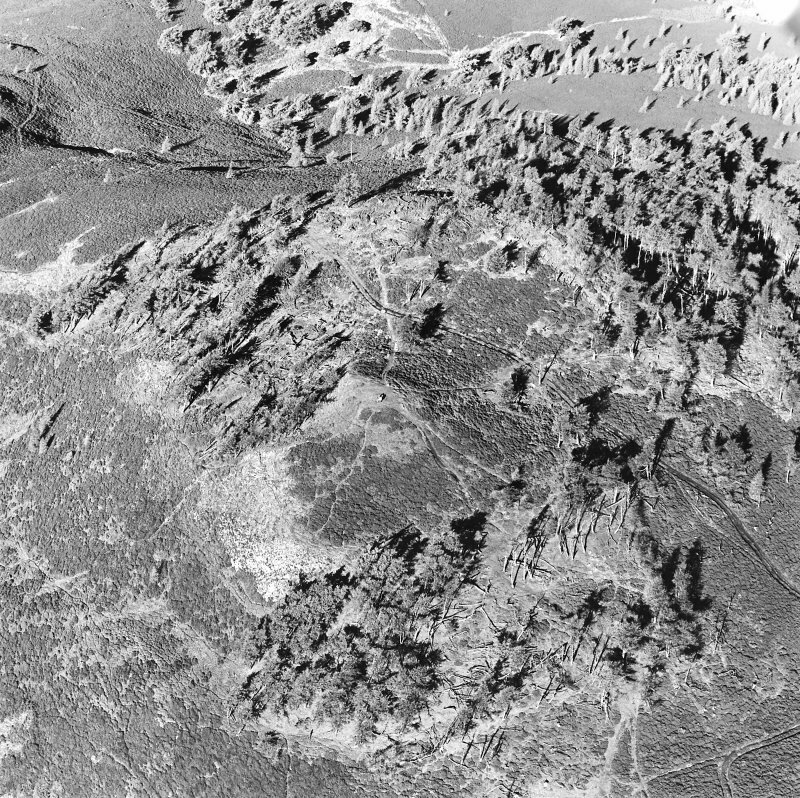 The plateau is precipitous on the south and west and is defended on the east and SE by a set of five ramparts with medial ditches, the ramparts reaching a maximum height of 1.5m above the base of the ditch. There are possible traces of a single stone wall running round the north and NW. Internally the fort is covered with trees, the southern half being occupied by a high natural knoll. 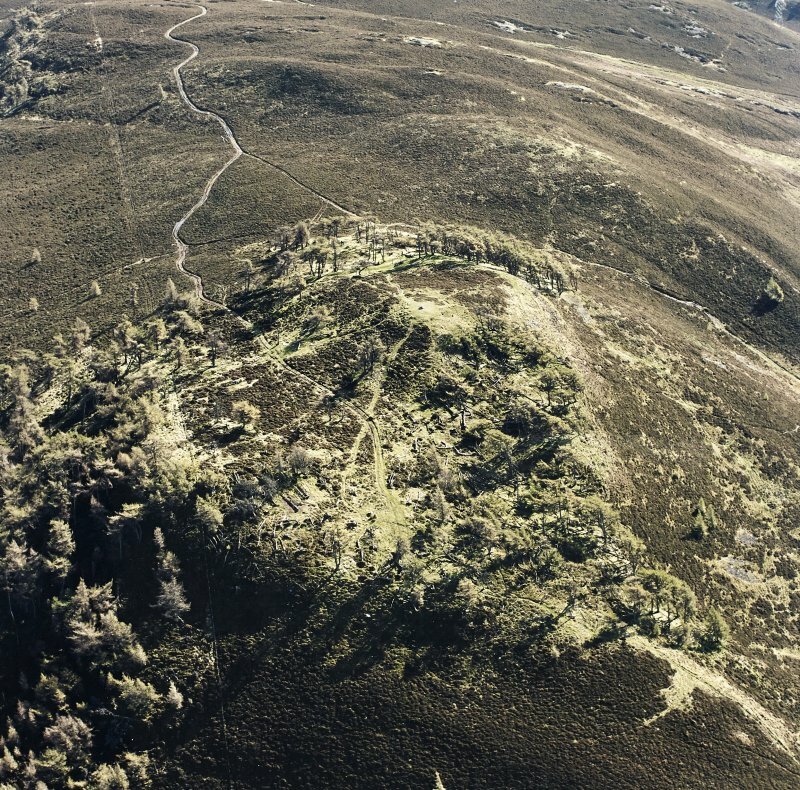 At NO 3545 3984 on the edge of the steep north slope is a possible cairn 5.0m in diameter consisting of a continuous circle, of large stones embedded in the ground. The interior is filled with stone to a height of 0.2m. Statistical Account (OSA) 1794; Visited by OS (E G C) 14 December 1967. 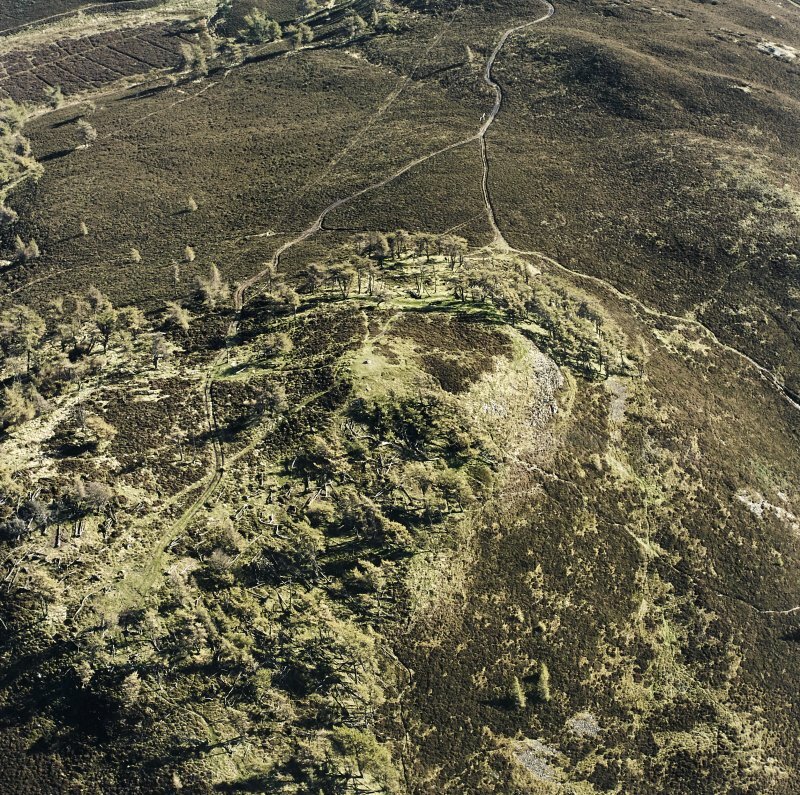 A large fort is situated on the broad plateau surrounding summit knoll of Auchterhouse Hill. It is defended by up to five ramparts with intermediate ditches on the SE and E, the two outer apparently earthen and standing up to 1.5m above the bottom of the intervening ditch, but the three inner heavily reduced by stone-robbing and barely visible. 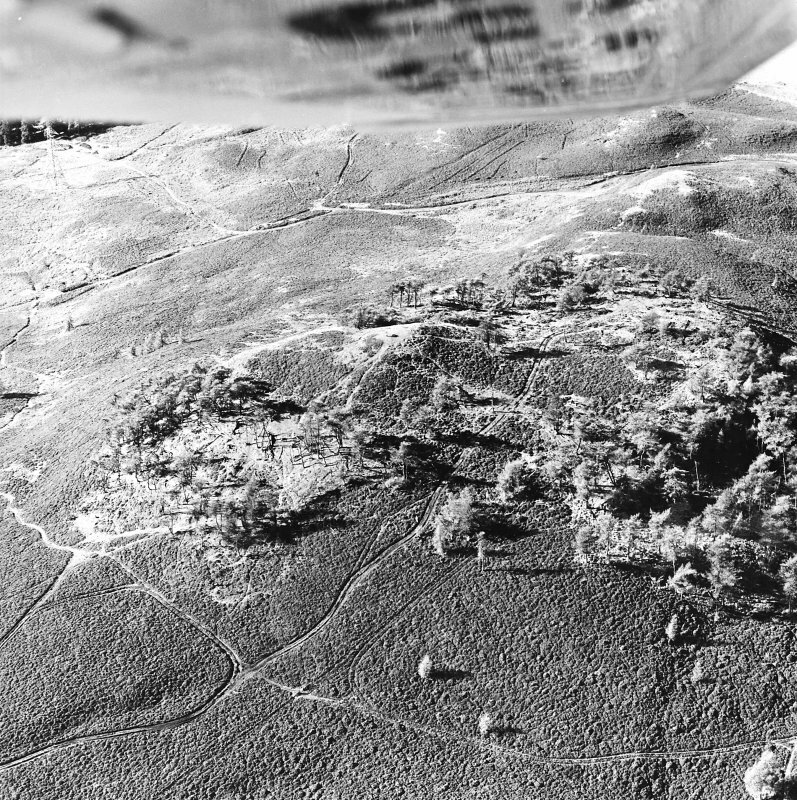 Indeed in 1967, the OS could trace only a single rampart round the NE and NW, while the steep SW flank was apparently left undefended. No detailed measurements of the interior have been recorded, but it measures in the order of 160m from N to S by 135m transversely (1.73ha), and no entrances have been observed. 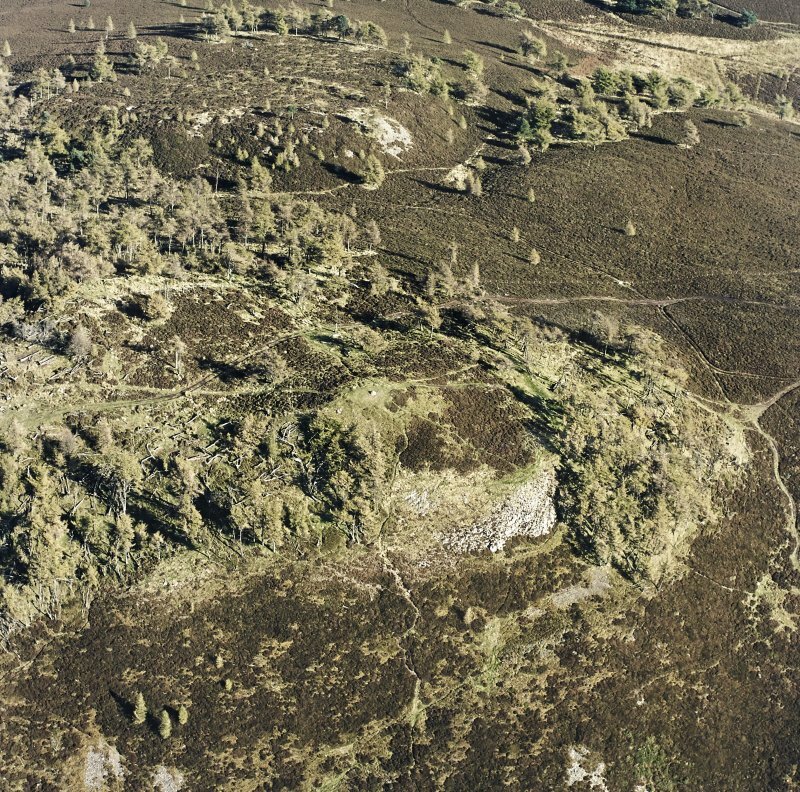 The only feature in the interior is what may be an earlier cairn measuring about 5.8m in diameter by 0.2m in height over a kerb of boulders.